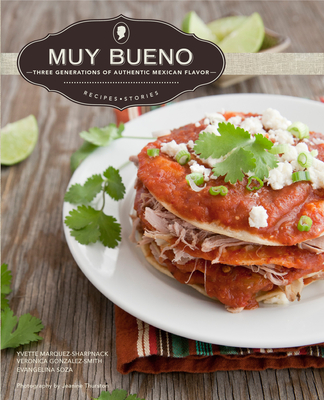 Spanning three generations, Muy Bueno shares over 100 traditional and original Mexican recipes that cover everyday staples like homemade tortillas and salsas; comforting classics like Albondigas Soup, Chipotle Shredded Pork Enchiladas, and Chicken Mole; delicious desserts like Coconut Tres Leches Cake and Pumpkin Empanadas, plus aguas, paletas, and festive cocktails This unique collection offers traditional old-world northern Mexican recipes from grandmother Jeusita's kitchen; favorite Tex-Mex home-style dishes from mother Evangelina; and original Latin fusion recipes from daughters Yvette and Veronica. Whether you are enjoying family taco night or hosting an elegant dinner party, Muy Bueno has something for every taste You'll find classics like Enchiladas Montadas ("Stacked Enchiladas"), Beef Flautas, and Chilaquiles alongside lighter such as Shrimp Ceviche and Tilapia with Mango-Avocado Salsa. Don't forget warm Apple Empanadas and tempting cocktails like Blood Orange Mezcal Margaritas and Persimmon Mojitos. Fans of the Muy Bueno Cookbook blog and chile novices alike will want this cookbook on their shelves.